The Arctic Ocean consists of a deep basin, submarine ridges, continental shelves, and marginal plateaux (Figure 8.2). Five major seas — the Barents, Kara, Laptev, East Siberian and Chukchi — are located at the wide and shallow European and Siberian shelves which occupy about 35 per cent of the entire ocean and contain only 2 per cent of the total volume of water (Pickard and Emery, 1990). The shelves are limited by the Greenland Sea in the west and Chukchi Borderland (comprised by Arlis plateau and Chukchi Cap) in the east. The Eurasian basin is dissected by the Nansen-Gakkel and Lomonosov Ridges. 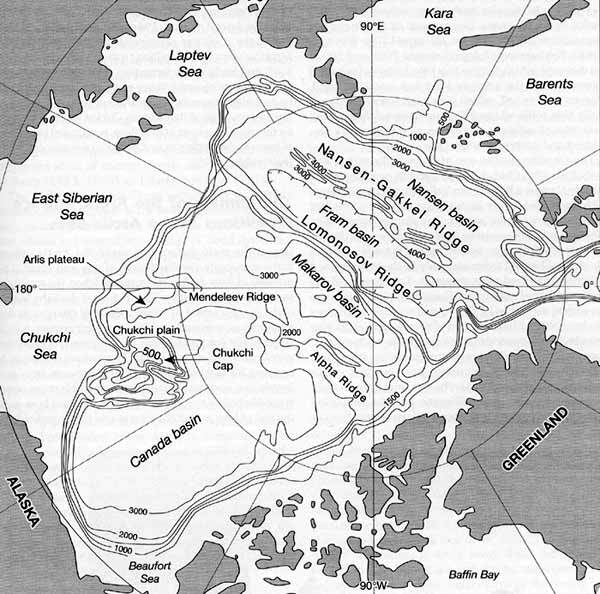 The active Nansen-Gakkel Ridge is 1500 km long, rises 2000 m above the sea floor and has a complex topography suggestive of numerous faults and fracture zones (Weber, 1990). The Lomonosov Ridge, which rises 3000 m above the sea floor and extends for 1800 km, was discovered by Soviet scientists in 1948 to the disappointment of the Americans who, unaware of the Soviet exploration, 'rediscovered' the ridge a few years later (Worthington, 1953). The Barents sector of the European shelf is limited in the east by Novaya Zemlya and the St. Anna trough and in the west by the Fram Strait and the Norwegian Sea, which connects it with Atlantic waters. The depth varies between 100 m and 350 m except in the Bear Island trough where it reaches 500 m (Weber, 1990). Bottom topography is complex with many submerged ridges, banks, and depressions. Two terraces related to the last two glaciations occur at about 200 m and 70 m (Klenova, 1966). The submerged slopes between 70 m and 200 m are dissected, which testifies to a long history of subaerial erosion, while the younger level has smoother relief. Meagre river runoff, which goes mainly into the fjords of the Kola peninsula and Novaya Zemlya delivers small quantities of sediment; silt discharge is reduced by permafrost and winter freezing of the rivers. The Siberian shelf is one of the world's widest and is shallow. The Chukchi sector, which occupies about 900 km2 between Barrow Sea Valley and Wrangel island, is characterized by low bathymetric gradients. The East Siberian sector is a flat and shallow plain approximately 800 km2 wide; the western and central parts of the sea are only 10-20 m deep and in the east the depth reaches 30-40 m. The shelf is dissected only by the Indigirka and Kolyma submerged river channels. Topography of the shelf was shaped mainly by subaerial erosion during the sea retreat as well as by fluvial sedimentary discharges (Weber, 1990). The formation of subsea permafrost also dates back to the period of marine regression. Topography of the Laptev sector comprises numerous submarine valleys of erosional and tectonic origin (Holmes and Creager, 1974). The erosional features were formed at the end of the Pliocene and the beginning of the Pleistocene when the sea level was lower than at present. In the lower and middle Pliocene, under conditions of rising sea level, the previously eroded valleys were partially buried (Ionin, 1966). Sedimentation is high due to the discharge of suspended matter by the rivers Lena (on average 11.3 million t a-1) and Yana (6.2 million t a-1) and leads to the formation of shallows and banks in the nearshore areas. River sediments are transported by turbidity currents across the sea to be deposited at the eastern edge of the Nansen-Gakkel Ridge. The Kara sector, which is about 100 m deep, is occupied by a series of terraces descending in northern and western directions (Fairbridge, 1966).